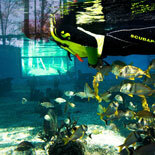 Price includes Admission into the St Augustine Aquarium. The St Augustine Aquarium is interactive, educational and FUN! Experience our 80,000-gallon Florida Reef habitat with over 250 reef fish and rays or better yet, have a Snorkel Adventure with them! 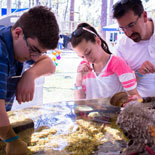 Touch Horseshoe Crabs, Starfish and more at our hands-on invertebrate exhibits. Enjoy the new Touch and Identify Seashells, check out Seahorses, dig for Shark Teeth, interact with our Goliath Grouper Harley and Sharks and Rays at the Shark & Ray Cove. You can FEED the sharks and the rays! Educational presentations by marine biologists daily. Nature Trail with Fresh Water Habitat coming soon! 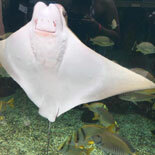 Experience over 250 Florida Reef Fish and Cownose Rays in the Florida Reef Habitat! Come enjoy the Seahorses, touch the Starfish, Lightening Whelk, Horseshoe Crabs and more! Check our our Shark & Ray Cove! You can feed the Sharks & the Rays! Dig for shark teeth, Identify what shark it came from,& take your favorite one home! The Snorkel Adventure takes place in an 80,000-gallon Florida Reef Habitat where you will be surrounded by Caribbean reef fish. The water is 80 degrees year round. All the gear is provided including snorkel, mask, wetsuit, shoes and vest. Clear vision rafts are also available. Bring a bathing suit, towel and dry clothes. Lockers and changing rooms provided. The whole adventure takes an hour. The St Augustine Aquarium is interactive, educational and FUN! ee over 200 Florida Reef Fish & Cownose Rays in the Florida Reef Habitat! Labor Day to Memorial Day: Tuesday-Sunday 10:00am-5:00pm. Memorial Day -Labor Day: 7 days / week 10:00am-5:00pm . Reservations are not needed to enter the Aquarium, but the Snorkeling Adventure should be confirmed in advance. Ticket will have details. Children prices are 4-12 yrs. of age. Children under 3 yrs. of age are free. Child snorkel ages 4-12 years must snorkel with an adult. Under 4 can not snorkel. Check our our Shark & Ray Cove!